Budgies tend to bond closely with their people once they're sure of them. Your budgie may be as friendly as can be, as far as he's concerned, but to you he seems anxious or not fond of your company. For an untamed budgie, you are a potential predator and threat. Let him get used to you and you'll see a world of difference. Let your little guy get used to his surroundings if he's new to your family. Put his cage in a semi-busy room where he'll be able to watch you without being overwhelmed by loud noises. Talk to him in a sweet voice every time you walk by his cage. Say something like, "Hey, pretty bird" or something similar. Even just saying "Hi, birdie!" may do the trick. The goal is to use a friendly tone when you walk by; he'll get used to this voice, so use it with him always. Drop a special treat in his cage as you walk by for a few weeks, or hold some millet spray in his cage from between the bars. Like many other animals, budgies will become fond of the "hand that feeds them," especially when they're getting yummy treats from that hand. Sit beside your budgie's cage while reading the paper or watching TV. Talk to him every now and then while you're sitting there. You can talk to a budgie about anything, so open up! As long as you have a gentle, friendly voice while you're talking, you could pour your heart out to him. Put your hand in his cage and hold it still, but only after he's comfortable with you sitting beside him and talking to him. Signs that he's comfortable with your presence include going about his normal routine in your presence. He should be eating, playing and singing in your presence and not trying to get to the farthest corner of the cage. Offer treats from your fingers while your hand is in the cage. Again, hold your hand steady, as a shaky hand or one that's moving toward him could make him uneasy. Move your fingers toward his chest to initiate a touching relationship, once he's comfortable taking treats from you within the cage. Do this slowly and use your index finger. Slightly push your finger against his chest to encourage him to step on it. Bring him out of the cage on your finger slowly, or start encouraging him to come out of the cage by holding your finger outside an open cage door. 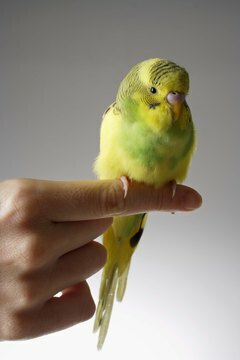 Encourage your budgie to hang out on your finger or shoulder for daily tasks. The more time he spends with you once he understands you're not a threat, the more friendly and loving he'll be with you. Each step of this taming process can take a couple of days to a week. Try to have a couple training sessions a few times every day. The goal is for him to get used to you, so persistence, consistency and patience will pay off in the end.